Happy New Year! Welcome to 2014-- from what we can tell already, this is going to be a good one! One of our New Year resolutions is to be better about getting Paddy's nails to a reasonable length. (Such an exciting resolution, right?) Since she's a mostly indoor dog (though this is soon to change, spoilers! ), she doesn't get the usual wear and tear that helps to keep nails to a healthy length. While we are absolutely petrified about trimming them ourselves, we recently stumbled upon the Beckky Board. 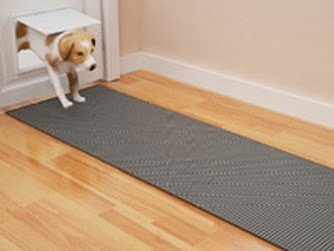 A walk-over nail-filing mat for dogs, its abrasive surface helps to wear down your dog's nails every time they walk on it. Think of it as a giant sand-paper mat. Gentle enough that you can walk over it in bare feet, Paddy barely noticed it when we put it down for the first time. In fact, she actually enjoys playing with her toys on it since she doesn't slip around as much as on our wooden floors. Since we're in a small apartment, finding the ideal spot for the Beckky Board has been a little tricky, but if you were in a "normal" home there are definitely lots of spots where it would get ideal traffic (ex. front door, between kitchen and living room). 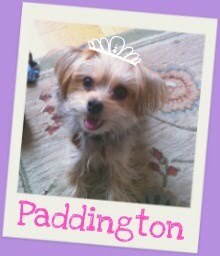 There are two sizes, and we've included a picture below of Paddy (who is currently 6lbs and 2oz) on her Beckky Board. We've currently got ours between our "living" and "dining" space, so she has to cross over it in its full length several times a day. We also play fetch in this area, which helps to get her running over it a few times. According to the website, we should hope to see results in about two weeks or so. While ideally using the Beckky Board will help the quicks of her nails to recede, we'd settle for less trims. Paws crossed! How do you keep your dog's nails in check? I currently file my dog's nails and I sneak in a clip here and there while he's asleep. But this method hardly keeps up with how fast his nails grow. So, I'm thinking about getting a Beckky-board. It seems like a good idea, but wondering if you could update us on its effectiveness. Thanks. Paddy is all kinds of adorable btw! Thanks for stopping by! So far, we're still enjoying our Beckky-Board! Not sure if it's doing as much as we'd like it to (but honestly, we live in a tiny tiny apartment so it doesn't get much traffic in its current location), but I think it is helping. It probably won't replace the monthly nail trims, but I DO think it does do some maintenance. Again, going to depend on how active your dog is on the board and where it's located in your home. Hope that helps! Did the Beckky Board turn out to be a good purchase?